Much of the talk leading into Friday night’s Penguins/Blue Jackets game centered around how the Penguins might handle Brandon Dubinsky, or anyone else that takes a run at Sidney Crosby. At the center of this was recently called up Tom Sestito. Sestito told Josh Yohe of DKonPittsburghSports.com that he would go after Dubinsky or anyone else that went after their stars. After all that build up, Sestito was a health scratch for Friday night’s game. With the Penguins finally getting healthy, someone had to sit. Sestito was the obvious choice. So much for that potential “confrontation” between Dubinsky and Sestito. Although there was one major scrum that took place in the game, which involved Rene Bourque, Ian Cole, and Nick Bonino, there wasn’t a lot of out of control stuff that took place. No, these Penguins had bigger goals in mind for Friday. They were in the midst of a playoff race. They needed these two points in Columbus, rather than focusing on any kind of “revenge”. Although the Penguins fell behind 1-0 early, they responded in quick fashion. 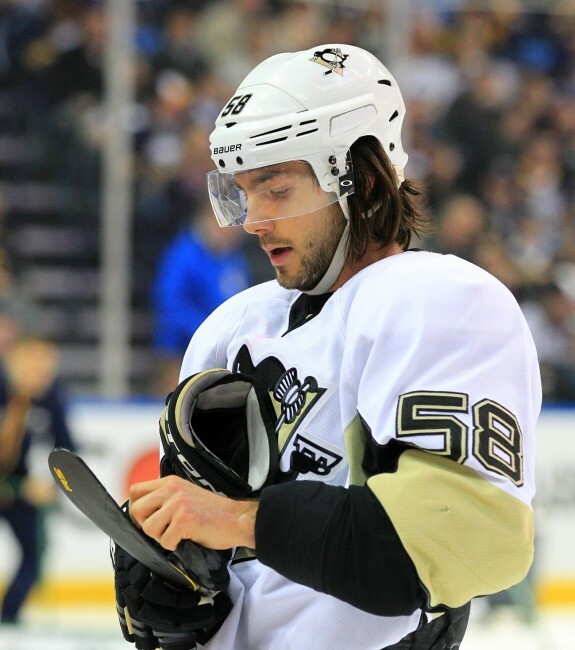 They tied the game on a beautiful shot by Kris Letang. Then in the second period, the Penguins flexed their muscles and demonstrated that they were the better team. Chris Kunitz gave the Penguins the lead in the first minute of the second. Kunitz set himself up in his office in front of the net, and powered a Patric Hornqvist rebound home. These are the kind of goals the Penguins need more of. Kunitz beat three Blue Jackets around the net and won the battle. After Cam Atkinson converted a breakaway two minutes later, one of the newest Penguins Carl Hagelin restored the lead for good. Sergei Bobrovsky left a big rebound in the slot on a Trevor Daley shot. Phil Kessel got the puck to the front, where Hagelin pounded his backhander home. The Penguins played in control the rest of the game and skated off with a much-needed 3-2 win. It was an impressive effort on many fronts for Pittsburgh. Friday night proved to me that there’s something different about the Penguins than in year’s past. These are the kind of games that the Penguins must win if they want to solidify a playoff spot. In year’s past, these were the kind of games that escaped them. Recall just last season that Pittsburgh was in a similar position fighting for the playoffs. They had a game in Columbus that they needed to win. A Nick Foligno hat trick propelled the Blue Jackets to a 5-3 win last season. Pittsburgh won their last game in Buffalo and limped into the playoffs before losing in five games to the Rangers. Pittsburgh did much better this time around. They drove the net. They played good defense. This is different from the Penguins of the past. This bods well for their chances of playoff success. The Penguins have always been known for their offensive star power and lack of defense. At least for one Friday night in Columbus, they showed us they can win a game based on good defense and gritty play. They were able to match the challenge that the Blue Jackets presented to them physically. The other thing the Penguins demonstrated Friday night that jumped off the screen was their speed. I cannot recall a Penguins team in recent memory that has the speed this team has. Crosby showed his speed on a play streaking down the left-wing, and leaving Cody Goloubef in the dust. Kessel, Malkin (until he left the game), Letang, and now Hagelin all have blazing speed. They can now keep up with the top teams in a playoff series where they couldn’t do so before. At no point during Friday’s game did I feel like the Penguins were going to let the game get away. Sullivan has brought a level of accountability to the Penguins that I haven’t seen in a long time there. Yes they won many games over the years. But Dan Bylsma and Mike Johnston weren’t able to keep the team accountable like Sullivan has. The evidence is in their on-ice play. They are confident. They are winning games with speed and defense as opposed to just offense. The Penguins have transformed into a complete hockey team right before our eyes. The vibe around the team has changed. Will it translate to playoff success? We’ll see. But for now, they’re marching towards the playoffs with a confidence not seen in years. This team is different now, and that’s a very good thing.